It’s a fancy word for pride or arrogance. People express this negative attribute in many ways, some of which are obvious. Others are more subtle and reveal a systemic lack of thought or reflection. 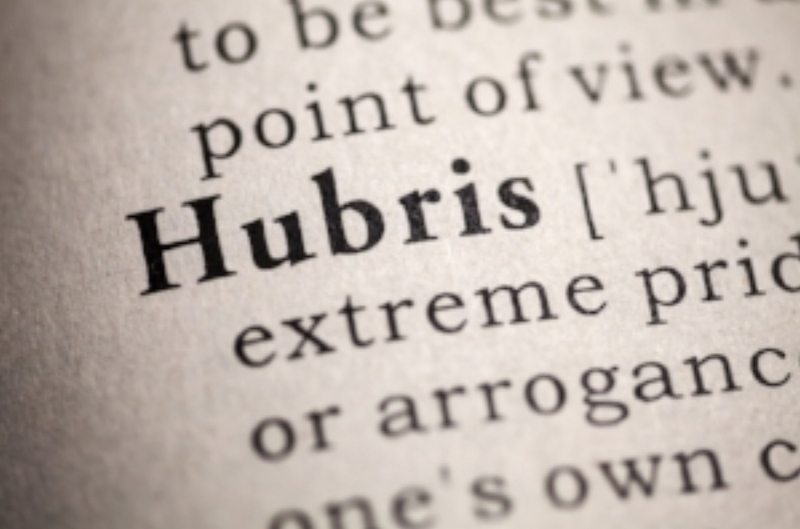 Depending on your philosophical bent, the word hubris could conjure an image in your mind of a polarizing figure, such as President Barack Obama or his political counterpart President-Elect Donald Trump. Both are arrogant, and both believe his worldview is superior to opposing views. This same hubris trickles down to those who ascribe to a similar worldview, expressed publicly on infantile Facebook diatribes, melodramatic YouTube meltdowns, vicious Tweets, and disruptive protests. People on both sides of the political spectrum have done this. Both believe and behave fervently that his or her view is correct and diametrically opposed to the counter belief, and both sides behave like fools at times. This form of hubris is blatant but is often the precursor to a more subtle arrogance, one that suppresses rational thought or reflection. At this point in the mental process, hubris ceases to be an assurance of right. Someone who believes he is right can come across as arrogant, but that confidence protects him from the need to act like a childish fool. It is only the insecure belief that feels the need to attack when met by an opposing view. Culture has become less about defending personal beliefs and more about attacking the beliefs of others. A person no longer has need of a strong, rational defense, only loud, blind vitriol against those who oppose. This is called intellectual laziness. Atheists, Christians, Liberals, and Conservatives do this. It is not unique to any particular worldview. It never has been. The Apostle James quotes from the Old Testament when he wrote in chapter 4 verse 6, “God resists the proud but gives grace to the humble.” Some people have it in their minds that the word resist in this verse means ignore. Resist, however, is an action verb. It’s where we get the word resistance. Resisting arrest doesn’t mean you ignore the officer putting you in handcuffs. It means to fight or oppose, to struggle against in order to win or break free. In the next verse, Christians are extolled to “resist the devil and he will flee from you.” James doesn’t say ignore the devil. He says fight, push back, resist. Verse 6 takes on a whole new meaning when you imagine God pushing and fighting against a prideful individual. Hubris and grace are the equivalent to spiritual oil and water. By their nature, they cannot mix. The only allowable confidence any human should express is in God’s promises expressed in His Word. Period. God resists the proud because pride omits the ability to say “I am, or could be, wrong.” Without this reflective pause to assess a personal worldview, all anyone is left with is attacks on those who oppose. Intellectual laziness. Foolishness.